If Jake Tapper were a real objective journalist he might want to learn the insignificance of labeling something bi-partisan. In this case, a Points of Light Foundation gathering, the Bush equivalent of the Clinton Foundation, involves the globalist who promised us he would impose their glorious new world order upon us. The Bushes are the same criminals as the Clintons, there’s just more family members to become candidates and more slices needed to the pie. For Tapper to say the event was bi-partisan showcases his ignorance or his complicity in the fraud. Calm down, Jake, it’s not the big deal you’re making it out to be. Folks are going to think you’re in the tank for Hillary Clinton. They’re all members of the globalist party, one that was paid for by the American people, that most of us aren’t invited to and would not want to be associated with if we were. Hillary Clinton is also a member. 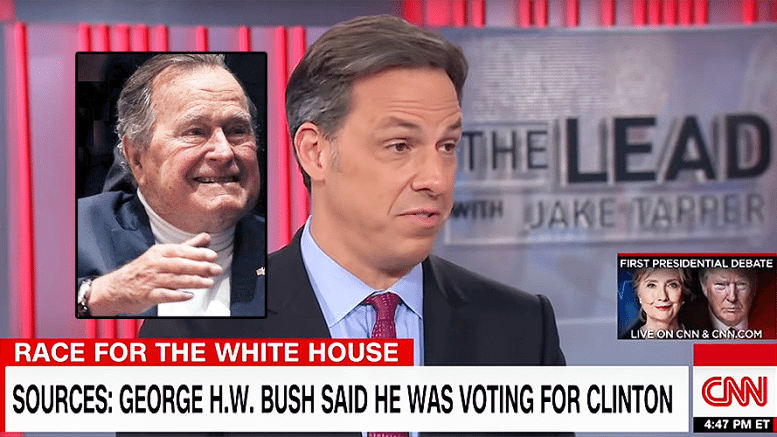 Tapper is euphoric at the idea that George H. W. Bush announced to a room full of establishment globalists that he’d be voting for Hillary Clinton. She and Bill are no different from him and his boys, so she’s the logical choice. He’s not a conservative, he doesn’t care about the American people or this country. H.W. is just like his father, Prescott Bush, a profiteer whose bank, Union Banking Corporation, served as one of Hitler’s banks while Americans were being killed on the battlefield by the arms it financed. They are in a unique position to exploit our nation for profit, just like the Clintons. Neil Bush, the shyster who bankrupted Silverado Savings and Loan and put the American taxpayers on the hook for $150 million, runs the Points of Light Foundation. Sure, we’re supposed to believe that everything the Bush’s did was in defense of America and that they are some kind of great patriots. That’s just not true. H W’s global new world order is a violation of our Constitution and his son’s attack on Iraq was a major step into the quagmire of global terror we now find ourselves mired in. The acted in the interest of establishing global hegemony, with US corporation partners leading the way. Tapper is shocked and he goes to one of his bimbo “experts” who doesn’t deserve to be identified to reinforce his amazement. She echoes Bush’s anti-Trump position with her proclamation that she too is a Republican and she’s not voting for him either. 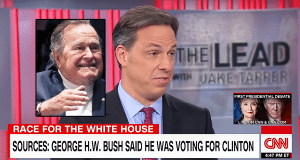 The reality is that Tapper isn’t a legitimate journalist and none of them, Bush included are what we all used to think was the definition of a Republican. They’re motivated by money and power, just like most of the parasites in federal government. Tapper’s job for now is to be a Clinton propagandist. That’s his network’s job as well. He might know the truth but he would certainly never report it. Remember, he told us who he was, though there is surely a lot more that is much worse, back when he was president. He was a globalist then, he’s a globalist now.